By Genny Liebes·	 7/1/2015, 2:36 p.m. The heat is ON on Thursday July 16th at Circles Thai. 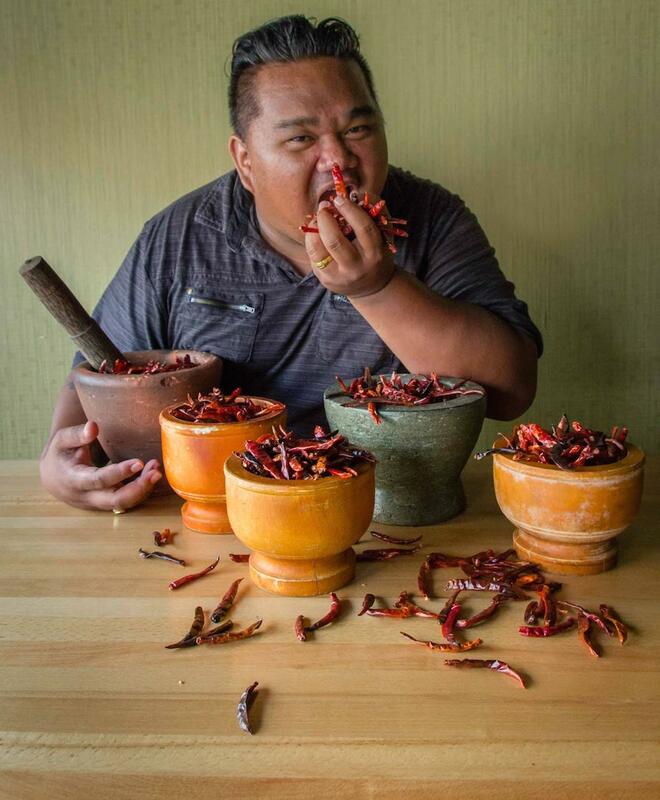 Here’s the deal: chef Alex Boonphaya is hosting a 5-course Thai Tapout dinner, and he’s so confident that his dishes are too spicy to endure that he’s buying dinner for anybody who finishes the full five course meal. Winners who “beat the heat” will also receive a complimentary t-shirt. It’ll work like this. Dinner costs $45, but can be made progressively cheaper by finishing the spicier courses. The first course is the most mild (4/10) and the last is the spiciest (10/10). If you make it through three, you pay $30. If you make it through four, you pay $20. If you attempt the fifth, you pay $10, and it’s free if you finish every last bite. Be warned: the fifth course features a ghost pepper concentrate–which is just crazy because concentrating the world’s hottest pepper into one fiery paste sounds just ridiculously dangerous. But also kind of cool. Anyway, keep reading, you masochists. Boonphaya insists that while Circles usually breaks down their dishes by ‘hot’ and ‘Thai hot’ they’re always holding back a bit. But he’s not holding back at all for the Thai Tapout. This, from Boonphaya: “I sincerely hope the guests who join us for this experience understand what they’re getting themselves into!” And he’s serious. You must be 18 years or older to enter (and sign your life and taste buds away) and pregnant women are prohibited from participating. Thankfully, there will be a few ways to cool off. Once guests tap out or beat the heat they’ll enjoy an antidote of Thai Ice Cream Sandwiches with Coconut Ice Cream and/or Sticky Rice with Peanuts, Condensed Milk and Coconut Shavings. To reserve your spot for Circles’ Thai Tapout, call (267) 687.1309.